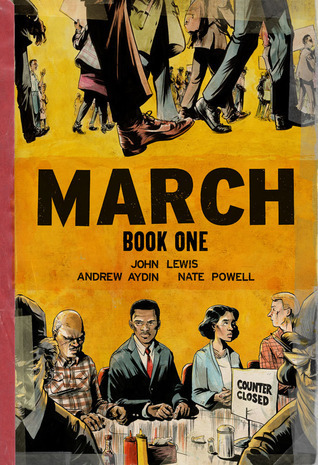 This week the book March: Book 1 by John Lewis caught my eye. "Well, neither can I -- but we might have to." Dr. King's message hit me like a bolt of lighting. He applied the principles of the church to what was happening now, today. It was called the social gospel -- and I felt like he was preaching directly to me. I went to the school library on Monday to find out everything I could about this man. Must read! No really stop what you're reading, if you can afford it go buy all 3 books if not hit up your local library and put it on hold. I'm assuming you'll have to put it on hold because all copies are checked out. This story is so moving and by Book 3 you will need a box of tissues because it is SO moving and emotional. All three books earned 5 stars in my book.